Around the time of year, late August through the end of September the Pawpaw fruit ripens. It happens to be the largest fruit native to North America. You wont a lot of information out there on this unknown fruit. Although it has been gaining some popularity in the Permaculture world as a food tree. If you live east of the Mississippi, or one of the couple states on the other side you have probably walked by them your whole life without realizing it. 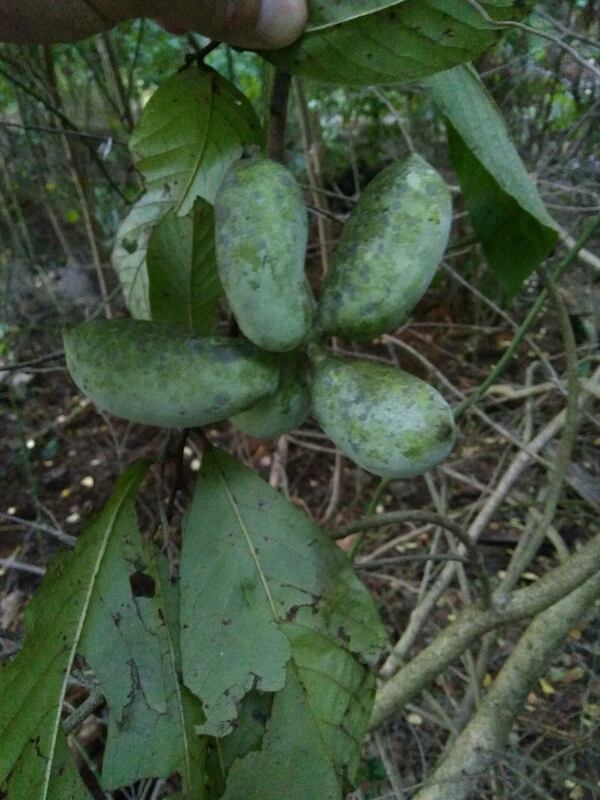 Pawpaws are a small understory tree. They seem to like shade, and wet fertile drainages. You might call them hollers, or draws depending on where you live. If you can find beavers, usually that’s a good sign Pawpaws are near. A big tree will be 20’ tall, but even 12’ tall trees will bear single fruits. They have smooth gray bark and large single lobed leaves. Always, if you find one there will be a patch. They seem to be shoots from the original and all the connected. The fruits hang in clusters of three or four. When they ripen, they either fall on their own, or you can give the tree a gentle shake to see if its ready to give up its fruit. The fruits themselves remind me of a very large bean, color of light green. Or a small baking potato. Pawpaw fruit to me is an unusual taste. For one thing it is a total thought shock that something with such a crazy flavor grows here. It tastes to me like a cross between mango and banana, but softer than each of those. It’s creamier, almost mealy. They don’t hold well and bruise easily. They oxidize to black very quickly. It’s not typical to eat the skin. I have eaten it before without ill effect, but I read somewhere that it was not good to eat. Also, do not eat the seeds. For one thing, they are huge. Like a giant bean. If you split them in half lengthwise, like if you were splitting a bean and scoop out the flesh with a spoon, that’s about the best way I have found. Scoop the flesh into a wire mesh kitchen strainer and press it through. This will separate the large seeds out. An easy way to eat it is scooped over vanilla ice cream. But, for the simplicity, I just prefer them raw, in the woods. Next August try them out, you may be pleasantly surprised.